The BCG600SIL Dose Control™ Pro is another Breville’s grinder which comes with 60 steps of grind adjustment and also a removable burr. With this you will be able to choose the best grind for your needs. 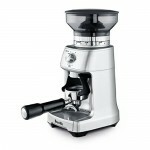 It comes with a timer that has the pause and cancel option and allows users to adjust grind time in 1 second increments. The grinder will provide you with consistent grinding and its stainless steel conical burrs are designed to minimize grinding heat and protect the essential oils in your beans. Its elegant design might also be a good reason for purchase. The stainless steel conical burrs are designed to minimize grinding heat and protect the essential oils in your favorite coffee bean. The burrs offer long term durability and can be used for a wide of coffee bean types and sizes. The grinder has adjustable upper burr to extend grinding range (from coarser to finer). By extending grinding range it is easier to achieve an ideal extraction or brew. The upper burr can be removed and adjusted to grind finer or coarser than the 60 factory settings offered on the grind adjustment collar. In manual you can find out more about those settings. Breville BCG600SIL can grind whole bean coffee suitable for a range of brewing methods, from the finest setting for Espresso to the coarsest setting for French Press. It will grind directly into porta filter, grinds container, permanent filter basket or paper filter. It is very lightweight. Grind is very consistent and comparable to other two reviewed Breville grinders. The hopper is made of clear plastic and holds approximately 12 ounces (340 grams) of coffee beans. It can be removed for washing fairly easily even with beans in it. It just blocks the access of beans to the burrs and you can remove in the very easily – that simplifies the cleaning. 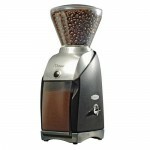 The grinder has locking system for easy removal, storage and transfer of the bean hopper. Breville BCG600SIL has removable grinds catcher tray for over-spills. It grinds directly into porta filter, grinds container, gold tone filter basket or paper filter so you can grind hands-free. There are 60 precise grind settings from the finest Espresso to the coarsest French Press grind. The place where you can adjust them is in the front of the grinder, beneath the hopper. In the manual they help you with the adjustment. The other useful function is electronic timer which is below the grind adjustment. Timer allows users to adjust grind time in 1 second increments and consistent dose every time. Another useful feature is that you can pause the grinding at any time, allowing you to collapse or settle the coffee, and continue with remaining dose when you are ready. You can pause the for up to 10 seconds during a grind cycle by pressing the start/cancel button. If you do not press that button after 10 seconds, it finishes grinding, so you can also stop grinding whenever you want in case you grinded more than expected. To start back up, press the start/cancel button again and you will grind the remaining time left. But if you are not sure of how much time you need to grind, press and hold the start/cancel button and release when you have enough coffee. The grinder itself is made of ABS plastic except under the bean hopper there is steel material where you adjust the timer. The rest is plastic, even gearbox is plastic – because of that you might have some problems with dark oily beans (like with most grinders) and you need to take a good look at the grinder to ensure that there is not something damaged with it. Similarly is the bean hopper made of plastic. The burrs are made of stainless steel. Grinder is manufactured in China. The grinder does not seem to be too loud. Loudness does not seem to be the problem with this grinder. Is very easy because you can easily remove bean hopper even with beans still in it. The instructions are given and cleaning is not too hard. The product is new so there are not many reviews of the product available. 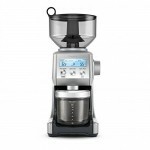 Breville BCG600SIL comes with the price of around 170-180$. If you are not willing to spend 200$+ for a coffee grinder, this might be the grinder for you. Breville BCG600SIL is the recent Breville’s grinder. It is new on market but is getting more and more owners. 60 grind adjustments and upper burr adjustment will give coffee enthusiasts a good reason for purchase. 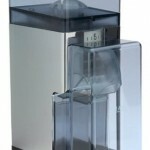 It has many other useful functions – they worked hard on constructing a useful timer. 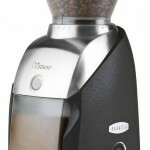 Certainly worth a consideration if you are trying to get a coffee grinder below 200$ price.